Borg & Overstrom Direct Chill P.O.U. Water Dispenser DC628. The direct chill model has soft touch buttons as opposed to mechanical lever taps. This ads to the stylish looks and the direct chill can generally produce a higher quantity of chilled water per hour than the tank fed coolers. 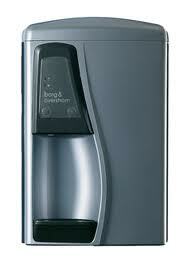 Borg & Overstrom’s success is based on the firm belief that water coolers should enhance an environment. A refreshment system that is easy to use, good looking and space saving, Borg & Overstrom point-of-use water coolers embody contemporary design and precision manufacture, providing purer-tasting water for every welcome break. This machine has a high quality compressor requiring no fan, thermostatic control regulated between 4 degrees and 11 degrees Celsius. Ice bank cooling system providing chilled water via a coil of stainless steel.